Whether it’s a private home, condominium, a hotel or a business, installing high-end safety tools is essential to maintain the foolproof security of the property. Crime protection will give youpeace of mind,there’s no doubt about that. The preferred method to secure your property is to secure the entrance.That’s why property owners and business managers prefer to install premium quality automatic gates.They enhance the look of your property while strengtheningyour security byadding another layer of crime prevention. Installing electronic gates at the entrance of your business premise will help you monitor and control the access of only authorized persons. However, this requires that you purchase a high-end automatic gate system, and Access Control Systems South Florida is a well-known and respected gate supplier and gate repair service in Florida. Based on the size of your entrance, your security preferences, and space for installation, you can choose to purchase swing gates, slide gates, overhead gates or abarrier arm gateas per your requirement. Check the features of different gates or consult withan expert of a leading fencing service provider and get personalized suggestions that will facilitate you tomake the best choice. 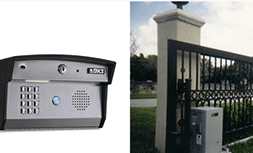 With increasing crime rates in Miami and other cities property owners can now take steps to prevent crime by install sophisticatedelectric gates from Access Control Systems South Florida such as a wireless intercom, proximity card reader, or wireless telephone entry system and transmitters. This will prevent the access of unauthorized persons and will enhance the security of the property. Besides security, automatic gates help protect your privacy so you can live the lifestyle of your choice. Be it community gates, driveways, residential or commercial complexes, electric gates takes security to a new level. A property having the right kind of electronic gate and proper fencing solution appeals to a large number of people. The gates add to the beauty and elegance of home exteriors and add value to the house. Property sellers are likely to achieve better resell value if they have installed sophisticated automatic gates at the entrance of the building and at driveways. You can find a number of automatic gate suppliers in Florida.Get 3 quotes and select an installer that provides you the best quality gates, is highly knowledgeable,and of course, gives a fair quote.Consult a professional and discuss your automatic gate requirements before finalizing the choice. Whether it is a sliding, swing gate, or barrier arm gate Florida, the installer will ensure that you select the gate that fulfils your requirement in the best possible way.